I thought I would add another brief look at the data on North Dakota’s labor market before we close up the year with new data releases next week. Once again these data go through November of 2016, and start in the immediate aftermath of the problems in the oil industry. The unemployment rate is one of the most often cited measures of labor market performance, though I am not sure why. It is not that it is a bad measure so much as it is employed in too many situations when it is not terribly informative. I often describe this situation as teaching a person to use a hammer so they think everything is a nail. So the unemployment rate increased in 2016, significantly. 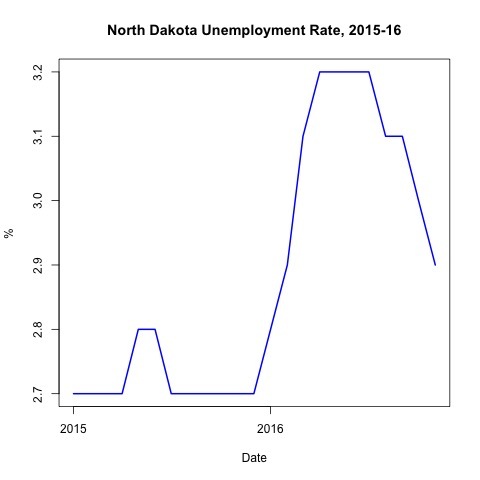 Recall though that North Dakota is a low unemployment rate, and low population state, and we are talking about an increase to a level that would be the envy of many other states. It requires a different way of thinking about the issues related to labor market at times. In the second part of 2016 the rate declined again, below 3%. Labor force, those employed plus those unemployed looking for work, is another variable to work look at in concert with other labor market measures. 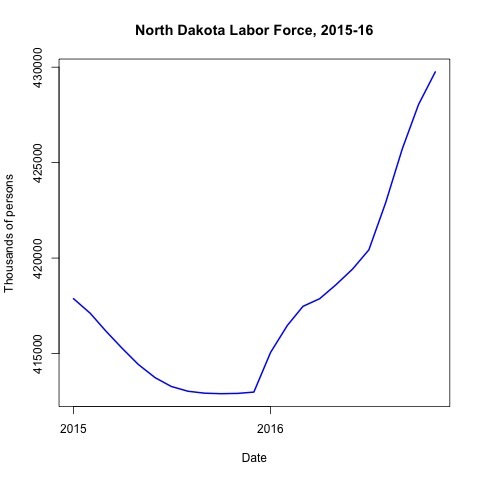 Labor force took a modest decline after the decline in the oil sector spilled over into the rest of the North Dakota economy. It since made a recovery and the labor force now is higher than ever. In many ways this only further confounds the broader picture of the circumstances in the North Dakota economy. Labor markets look good, but the state is dealing with a budget crunch. This is why I question whether textbook definitions of recession, or at least the definitions applied in other contexts, hold much meaning here right now. Data source: Bureau of Labor Statistics, Local Area Unemployment Statistics, North Dakota Labor Force and Unemployment Rate, downloaded January 21, 2017.